The new NDSU student senate was sworn in on Sunday and participated in their first meeting. Former College of Business student senator Jon Lipp swore in as the new Congress of Student Organizations NDSU student government executive with the rest of the student government executive team Sunday night. It should help having former CSO executive and now student body vice president Hilary Haugeberg just down the hall. 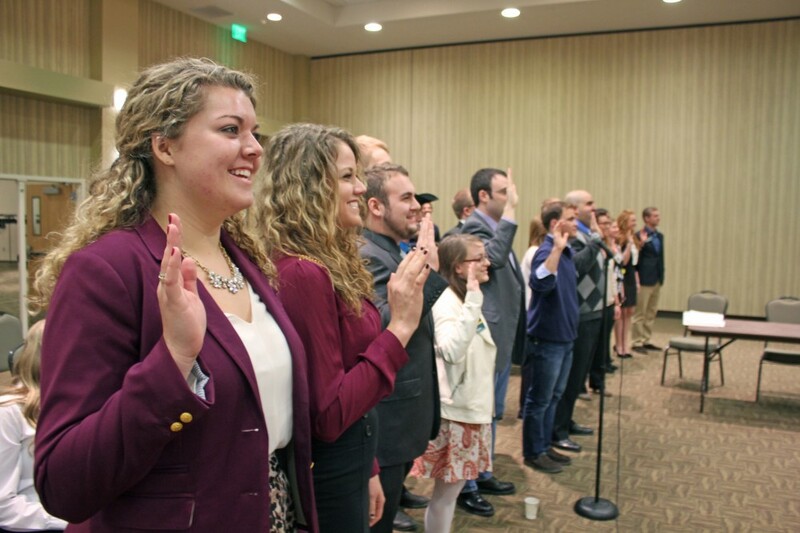 After former NDSU student government officers held their last meeting of the year, student body president Sarah Russell, Haugeberg and the rest of the 2014-2015 student government swore in to take their seats for the new year. Russell said after being elected in April, it felt good to finally step into the new role officially. Russell and Haugeberg both said they were nervous to be sworn in, but they are becoming more comfortable as more time goes on. Next school year’s executive team consists of former student government members who gained experience through their former roles. However, there is only one executive team member, other than Russell and Haugeberg, coming back from the 2013-2014 year. Russell said she isn’t worried about the group, which was hired from a field of about 40 students who applied. Haugeberg said she was excited to see where the group takes their new roles. She said she hopes they not only fulfill their current responsibilities, but also take things past their required job responsibilities. Communication and collaboration, Haugeberg said, is a major goal that the executive team hopes to meet at the beginning of their term. She said this can come in handy when different members need help for different projects. “We all have our own areas of focus, but we work together as a team,” Haugeberg said. Finding a line between youth and experience, Russell said, is key for finding a good student government executive team and student senate. Russell said this concept applies to the newly elected student senate. There are many senators who are returning to their roles next year, but there are also 10 senator positions open for the fall. Russell said these openings will give incoming freshman a chance to be involved with student government. Lipp said his experience with student government will be important for his time next year. Lipp, who was on the CSO commision for the past two years, said his familiarity with the committee and the position gives him a chance to focus on long-term goals rather than getting used to the job. Russell and Haugeberg hope to have over half of their platforms points started by the time the fall semester starts. The team also hopes to pick up a few projects outgoing student body president Robbie Lauf and vice president Erik Diederich began during their terms such as faculty-student luncheons and a sustainable model for Spring Blast. While Russell admitted there is no way to be completely prepared for her new job, she said she is looking forward to the challenges her new job and the new school year will present. FILE PHOTO | THE SPECTRUM Student body president Eric McDaniel acts as tie breaker for the 14-member SFAB, set to meet Wednesday to vote on fee increase proposals starting in fall 2016.